Back with part two of Nick’s injury story. 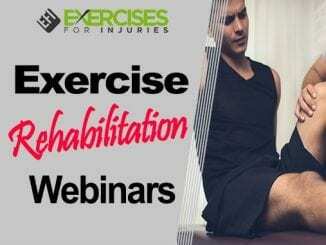 In part 1, Nick talked about how he used corrective exercise to overcome an injury. 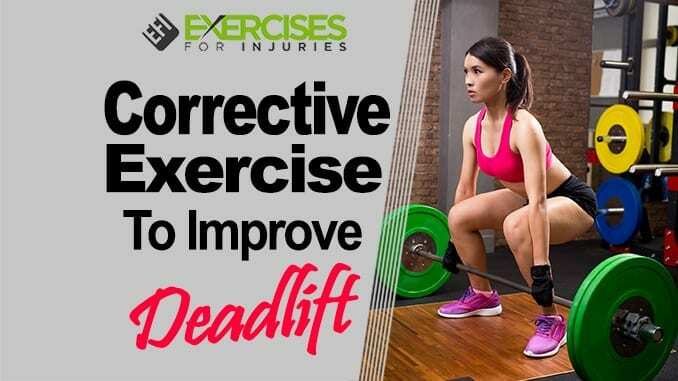 Now in part 2, he talks specifically how he used corrective exercise to help him with the deadlift. Enjoy the story and info. One day, I was doing sets of five on front squats w/chains. On the fifth rep of one of those sets, I felt something “give” on the left side of my low back. My entire low back was in pain and I couldn’t complete another set. I finished with some glute ham raises, cable chops, step ups, and a couple of other things just fine; however, the next few days my back hurt like crazy and I was definitely worried. I trained upper body fine and took the rest of that week off. The following week I felt a little better and was able to train decently. I got some tissue work done, got an adjustment and I felt like I was good to go; thus, I continued with my training for the meet and was actually hitting some PR’s for about a month or two after the “injury.” I decided against doing the meet but was still training pretty well. Now, what I should’ve done was taken a decent amount of time off from any type of intense training but when I’m in the zone, I’m in the zone. Anybody who’s competitive with anything can understand that. Well, the pain came back and I ended up making things worse as I tried coming back too soon a couple of more times. I had a grade 2 strain (at least) near the 12th rib attachment site of quadratus lumborum and actually had some bruising on the rib. This might not sound like much and there are plenty of worse injuries but it was terrible because it affected pretty much everything I did. Too much stress would cause spasms here and in many surrounding areas and it was real easy to restrain the area. The pain was nagging, sharp, annoying and sometimes extreme. 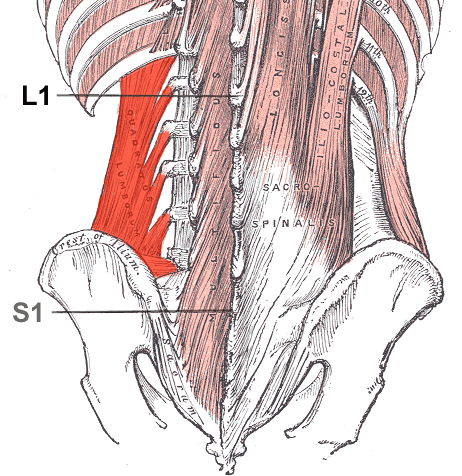 QL is technically a deep low back muscle though it can really be thought of as a very deep abdominal muscle. 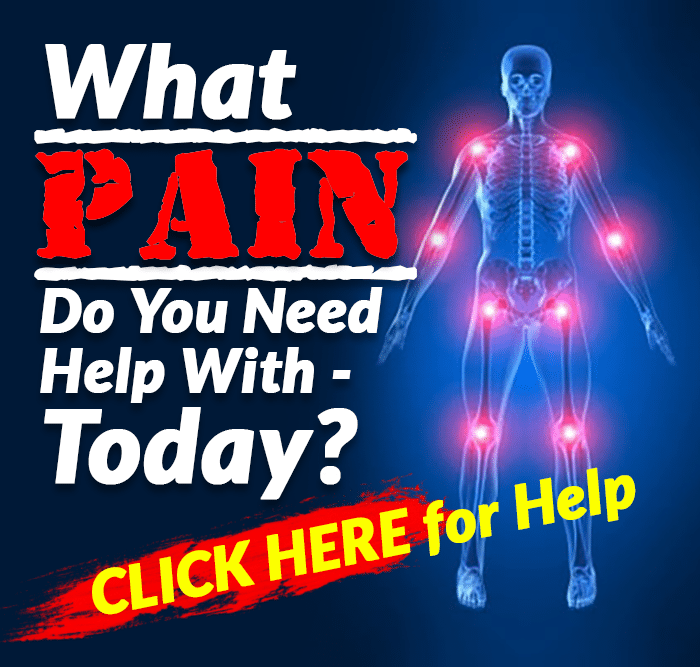 It attaches to the 12th rib, lumbar vertebrae and the posterior iliac crest and is a very important spine and hip stabilizer for almost any activity you can think of; thus, it was hard to give it the rest that it needed since its active so often. Since my left glute wasn’t doing its job for who knows how long, my left QL was working overtime and eventually gave. 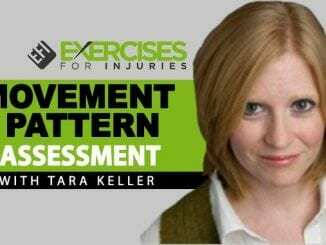 This was definitely a cumulative injury as the overload that occurred in this area from the rotation and shift that I had probably created a large number of microtraumas over time. I had neglected soft tissue work for too long and hadn’t addressed imbalances appropriately for long enough. 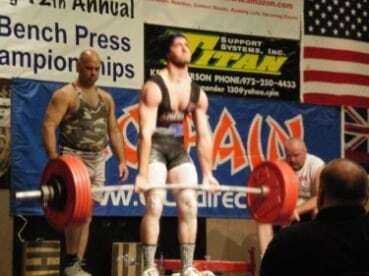 Needless to say, I had to back off from heavy powerlifting for a little while and I have eventually come to realize that the entire experience was a blessing in disguise. It forced me to take a step back to figure out the answers to some questions. What caused this to happen and what held back my lifts? What do I need to do to fix things so that I can come back stronger and healthier? I took some time off and then had to figure out ways to improve my body and strength without straining this area and making things worse. It took some time and it took some effort but I pulled it off. I focused on hammering out gluteus maximus exercises and gluteus medius exercises, with an emphasis on catching my left glute up to my right. I hammered out lots of oblique work to help stabilize my spine and pelvis better. I worked on biomechanics and technique until my shifts were almost eliminated. I invested in a sled so that I could strengthen my legs without straining my back. I got massage, ART and chiropractic care. I did everything I could to make myself better and heal the injury at the same time. When it had healed enough to allow it, I began to focus on getting my single leg lifts significantly stronger. I found that single leg variations didn’t aggravate anything while bilateral lifts seemed to aggravate it once I got to a certain weight. Single leg variations were something that I had done but had never really focused on getting strong with. Pushing these lifts up would help to iron out hip and trunk imbalances and increase strength and stability at the same time. I would rotate in 2-3 week cycles of barbell reverse lunges, front split squats, barbell step ups, yoke bar reverse lunges, one leg squats and bulgarian split squats while sometimes adding chains to keep things interesting. I ended up working in the mid to high 200 pound range for most of these, which was a good increase from where I had been before. For glute work, I put myself on a steady diet of one leg hip thrusts, one leg rdl’s, reverse hypers, clam shells, side leg raises, bird dog variations, cable chops, sled dragging, prowler pushing, kettlebell swings and other exercises that I’m probably not thinking of at the moment. I pushed these up consistently and am now doing one leg hip thrusts w/ a 135lb bar or lots of chains on my lap, one leg rdl’s with around 150lbs for reps, clams and slr’s with heavy bands and have gotten strong on all of these exercises. I’ve probably put on an inch or two on my glutes over the course of the past two years. I also did some psoas and adductor strengthening as my hips all over were not as strong or as stable as they needed to be. My back has always been a strong point for me while my hips lagged behind. For lower traps, I have done lots of Y’s, I’s, high to low rows and face pull variations. Since lower traps attach on T-12, which is close to that 12th rib, gaining strength, stability and endurance here has helped to provide added support around the area and also helped to rehab the area. For direct oblique and QL work, I got on a diet of side bridges, rotating side bridges, cable hold variations (split stance, tall kneeling, squatting, etc. ), cable chops, side holds and offset farmers carries. All of the single leg work obviously hit obliques and glutes as well. 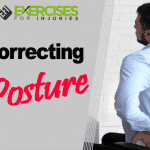 One great corrective exercise that I had used previously as well is the offset step up. You can either put more weight on one side of a barbell or hold a dumbbell in one hand, and do step ups. The offset weight will force appropriate oblique and hip muscles to fire in order to keep your body square. I have seen these work not only for myself, but many others as well. The added oblique and glute strength is a big help to QL since it now has the appropriate support from its friends. While I know that there are varying view points on reverse hypers, I absolutely love them and they were a big help in rehabbing my back and keeping strength up. The fact that I could train glute function along with trunk stabilization via low back muscle activity combined with the traction and decompression that the exercise provides helped me tenfold. If you do them correctly and with control, they are an amazing exercise for both posterior chain strength and recovery. For biomechanics, I had a great colleague and friend of mine watch my movement to help me find where neutral was while eliminating my shift. I did this with the use of lighter squatting and pulling with either a barbell or kettlebell. I did plenty of mobility work for hips and spine as well as some stretching for left TFL (part of the shift) and psoas. Previously, if I missed a deadlift, it was because of my hips. Getting my front or back squat up almost always meant that my deadlift would go up with it. So by now you are probably wondering, what happened with the old weak points now being stronger points and the biomechanics improving? Well, over the course of the past few months, I’ve dived back into some heavier bilateral squatting and pulling and I feel great. I’ve hit 30 pound PR’s on squatting variations after only a couple of workouts back at it and am gradually working my way back up on the deadlifts but pulled around 500 pretty fast and easy recently, and should be able to hit a PR when I really push it. I feel more stable and have more pop out of the hole with my new found glute strength that I never had before. I plan on hitting some big numbers over the course of the next year and I truly believe that had this injury not happened, I might still be guessing what it was I needed to work on. One more part to come. The above was part 2 and you can check out part 1. Thanks to Nick Rosencutter for the great information above.